I wouldn't say it's a tradition, but I have kept an eye on the annual Asphalt Industry Alliance Annual Local Authority Road Maintenance Survey (ALARM). 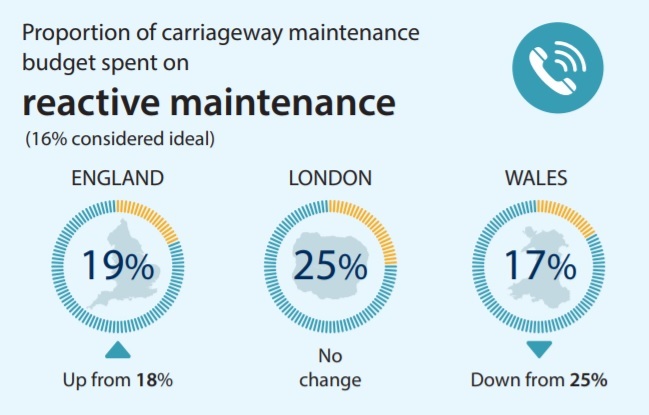 For those who have missed the survey before, it's a survey of local authorities in England and Wales which seeks to quantify the current state of the carriageways of local roads and so excludes footways, bridges and lighting. 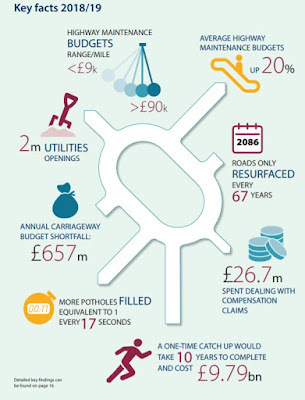 Last year was encouraging as the maintenance backlog had reduced from £12bn to £9bn, although it was a mixed picture. This year, it's still a mixed picture with the backlog sitting at £10bn. As ever, we have the key headlines in a graphic (above). Against the continuing backdrop of the motorway network expansion and other strategic (and so not local authority roads), the two-tier funding approach continues where we build and maintain large roads from national budgets and with local roads being funded through a mix of council tax and bidding for central funding pots. 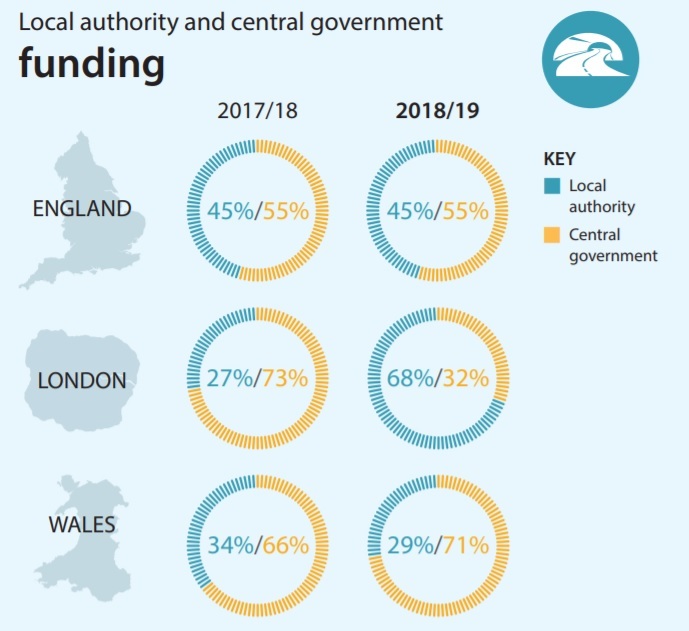 Interestingly, the funding mix for England (excluding London) has remained the same as last year with Wales getting a little more central funding. 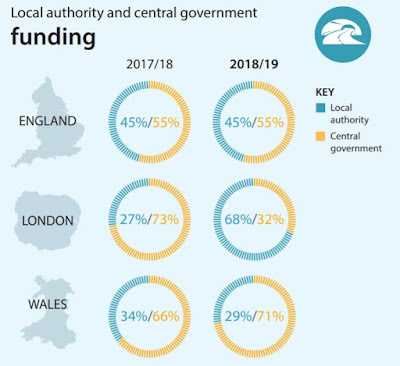 London, however, has seen a huge drop in central funding and this will be a direct result of the Government removing Transport for London's revenue support of £700m a year. The proportion of funding spent on reactive maintenance is also interesting. Now, I am not entirely sure where the ideal 16% comes from (it is generated by the ICE and CIHT), but in theory, preventative maintenance is more cost-efficient than reactive maintenance and so a high proportion of reactive maintenance is an indication of underlying problems as reactive work rarely deals with the root cause of failure. Wales seems to be doing well, England is going the wrong way and London has maintained its high level of reactive maintenance. 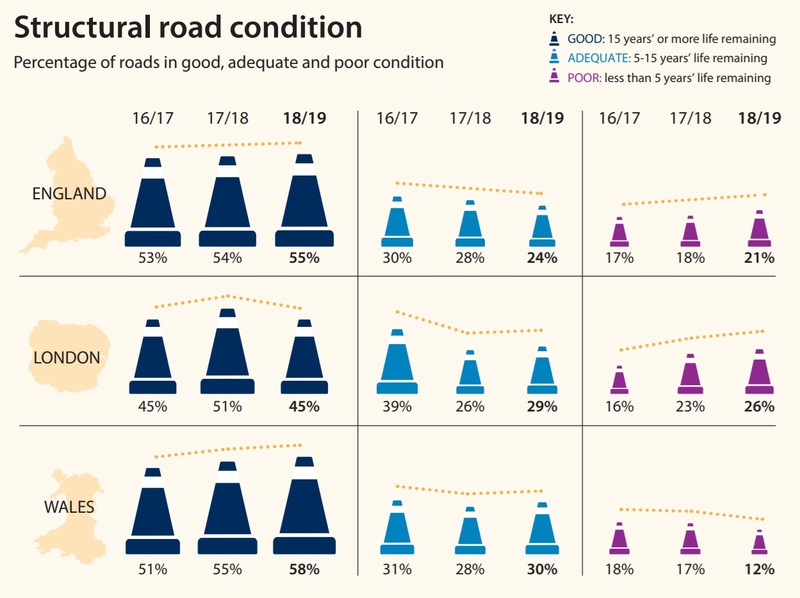 Structural condition is improving in England and Wales, although it's worth keeping an eye on the 'poor' roads with less than 5 years remaining because they'll end up sucking in money from a structural point of view. 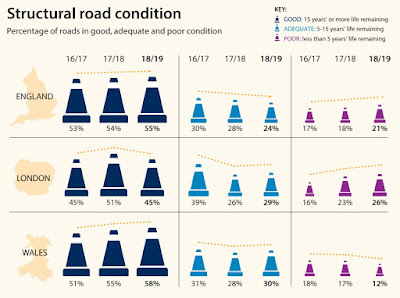 The roads are deteriorating in London, although it is a complex picture and my feeling is the 'poor' roads are going to be local streets rather than the TfL network and borough 'A' roads. The ALARM survey can only be a snapshot, but it shows that the highway maintenance backlog is remains stubbornly high. 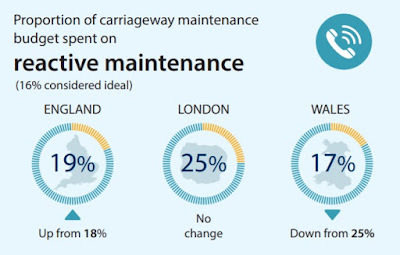 Throw in the £6.7bn backlog for bridge maintenance and the continued cuts to local government which tends to hit highway maintenance hard, the ride ahead remains bumpy. All this then makes it even harder to get a hard pressed council to resurface a tree root infested cycle path, which then deters people from cycling or pushes the brave few on to a main road. There is a bottom to the barrel and we are scraping it. I'm not aware of a similar survey dealing with footways and cycle tracks - must be billions as well.